Earlier this month I reviewed the Lush Star dust bath bomb from their Christmas range that came in my goody bag from the Lush Meadowhall VIP re-opening party. Today I'm reviewing the Five gold rings bubble bar*, which was also in my goody bag. 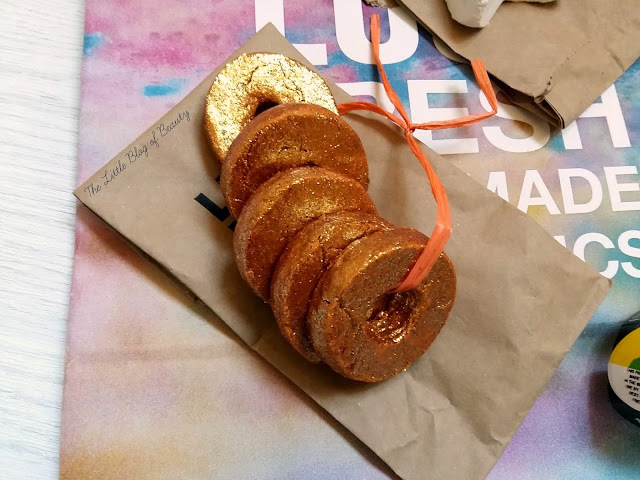 As the name suggests this features five gold rings (so it's not actually a bubble 'bar') that are secured together with a piece of orange string. The string isn't the prettiest to be honest but I guess it doesn't need to be as it's only purpose is to hold the rings together. As I'm sure you're aware by now I'm not a fan of glitter in bath products at all and unfortunately each of the rings is completely covered in gold glitter. You only have to touch one of the rings and your fingertips turn gold, which is then a pain to remove. I would never actually buy a bath product like this myself but as this was included in my goody bag I feel obliged to try it out and report back for my lovely readers. I'm assuming that as there are five gold rings the idea is that this will do five baths, although the five rings might just be to fit in with the name. I started off with one ring but ended up adding another because I wanted more bubbles. However this might be because I have problems adding bubble bars to my bath. There's no pressure behind our hot water so to stop the cold overpowering it you have to add some cold to the bottom of the bath then top up with just hot water. This means the hot water is very hot, so I can't actually crumble the bar under the water, I have to crumble it and kind of flick it into the water and I think this effects the amount of bubbles produced. In a recent chat I actually picked up a great tip for adding bubble bars to your bath. I don't know who tweeted it as I don't follow them so unfortunately I can't credit them but it apparently originally came from a Lush staff member. They said to use a colander to hold the bubble bar under the running water. As the water dissolves the bar this apparently produces masses of bubbles and depending on the size of the bar means you can get more baths out of it because you need to use less. I'm planning to buy some bubble bars for my dad for Christmas (I so converted him to Lush baths!) and I'm going to grab a cool little colander from somewhere to go with them for a bit of a novelty. Back to the Five gold rings bubble bar, the rings are really quite soft which I was really pleased about as I do struggle to break up harder bars, so much so they make my fingers really sore. Inside the bar is like a toffee colour and as I've already mentioned this is completely covered with gold glitter. There is a light scent that I would say is possibly vanilla/toffee/cinnamon ish but I could smell this most on my fingers after I'd crumbled the bar. This turns the water yellow, which unfortunately does look a little like you've had a wee in the bath, and the gold glitter is suspended in the water. All the glitter sits on the bottom of the bath once you've drained it but this is easily rinsed away and I was surprised to find that very little glitter was left on my skin afterwards. This one isn't particularly skin softening as there isn't really anything in there to achieve this and it's also worth nothing this one does contain SLS, which does disappoint me a little. I've already gone SLS free when it comes to washing my hair and am considering extending this to other products, I'm just a little concerned this might limited my choices too much. At £4.95 for what is effectively five small bubble bars this is very good value but it's not one I would personally buy again, mostly due to the glitter. If you like the look of the Five gold rings bubble bar you can buy yours in store or online. Have you tried anything from Lush Christmas range? Love the idea minus the glitter! I ALWAYS want more bubbles!